Sin taxes are excise taxes that the government applies to certain goods (or services) in addition to standard sales taxes. The motivation behind sin taxes is twofold: they are intended to deter people from partaking in certain activities that are viewed to be hazardous and they are an easy way for the government to boost revenue. There are arguments both for and against sin taxes. One argument against them says that it’s not the government’s place to tell people how they should or should not treat their bodies. While those in favor of them argue that when people get cancer from smoking or liver failure from excessive drinking, it’s the rest of society who ends up paying the medical bills. Regardless of personal views, we were curious about how effective sin taxes actually are and whether they affect human behavior. Bottoms up, America – Overall alcohol consumption is on the rise in America. But the increase is not uniformly spread. Wine and spirit consumption is on the rise, while beer consumption is falling. Our data shows that wine consumption has increased 38% since 2000. Taxes on cigarettes work – States with higher taxes on packs of cigarettes tend to have a lower rate of smoking among adults. In Connecticut, for example, the tax on cigarettes is $3.90 – the second-highest in the country – and the rate of cigarette usage is 13.5% – the second-lowest in the country. Taxes on spirits have the largest effect – Of the three alcohol types – spirits, beer and wine – we found that taxes on spirits have the biggest effect on consumption. Take Alabama, which has the fourth-highest tax on spirits ($18.24) and also the fifth-lowest spirit consumption rate in the country. In contrast, the tax rates on beer and wine do not seem to have as much of an effect on how much of it is consumed. For example, Kentucky which has the highest tax on wine at $3.05 per gallon consumes as much as Arkansas which has a wine tax of only $1.42. In the ‘Mad Men’-era, smoking was an everyday activity that many Americans partook in. Things are different now. There are strict restrictions on how smoking can be advertised, how cigarettes can be sold and where smokers are allowed to smoke. The negative effects of smoking on your health are also now very well understood. These two factors have certainly played a part in why the percentage of Americans who smoke is lower. But what about taxes increasing the monetary cost of smoking, how much did those change smokers’ behavior? The chart below compares the percentage of smokers in each state to how much a pack of cigarettes is taxed in each state. 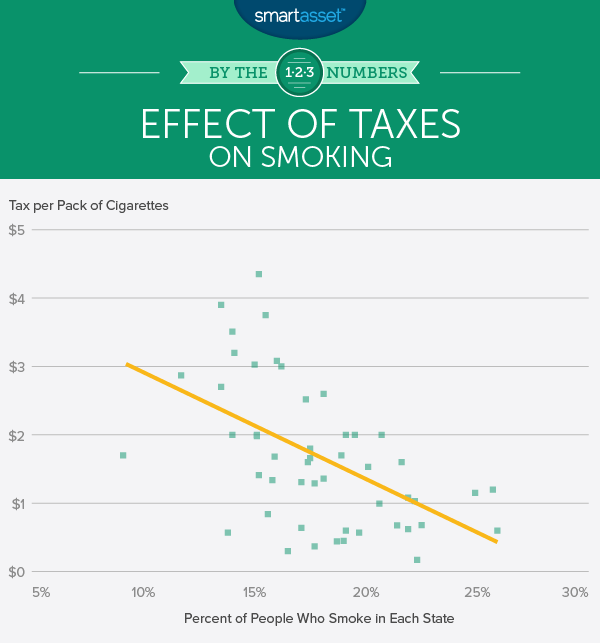 As the trend line shows, in general, places with higher taxes on cigarettes tend to have lower smoking rates. The exception to this is the South, where taxes and smoking rates don’t seem to be very related. Although Southern states overall have fairly low taxes on cigarettes, the states in the South with the highest taxes, also have the highest percentage of smokers. 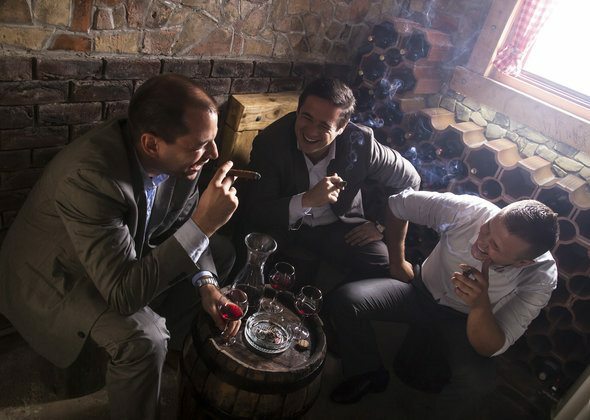 This could point to possible cultural and/or regional differences toward smoking. Although excessive alcohol consumption is generally believed to be unhealthy, the stigma toward it is less severe than the one around smoking. In fact, as we mentioned earlier alcohol consumption is actually on the rise in the U.S. Our data shows that if states want to lower alcohol consumption, increasing the sin tax rate may be helpful. On the chart below, the state to the far right, (that consumes the most alcohol per capita), is New Hampshire. According to our data, New Hampshire consumes 4.55 gallons of alcohol per capita per year. It also has the lowest taxes on alcohol, with only beer being taxed at 30 cents per gallon. The state has no taxes on wine or spirits. Alcohol taxes appear to be less effective at curbing binge drinking. The state which binge drinks the least is Tennessee which has a net tax rate on alcohol of $6.90 per gallon of beer, wine and spirits. 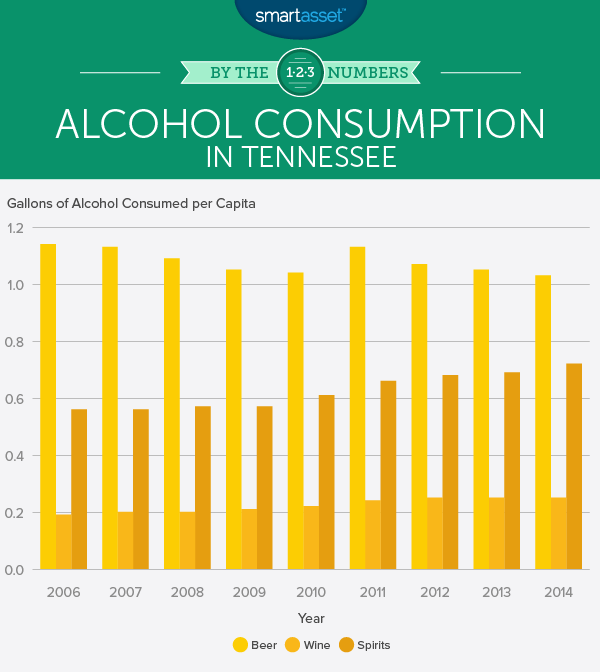 In Tennessee, 10.9% of the population binge drinks. The state which binge drinks the most is North Dakota and it has a similar net tax rate of $6.11 on a gallon of beer, wine and spirits. Despite the similarities in net alcohol tax rates, a whopping 24.9% of people in North Dakota binge drink. Washington is the state with a highest tax rate. If one were to buy a gallon of beer, a gallon of wine and a gallon of spirits, the net tax would be $36.85. 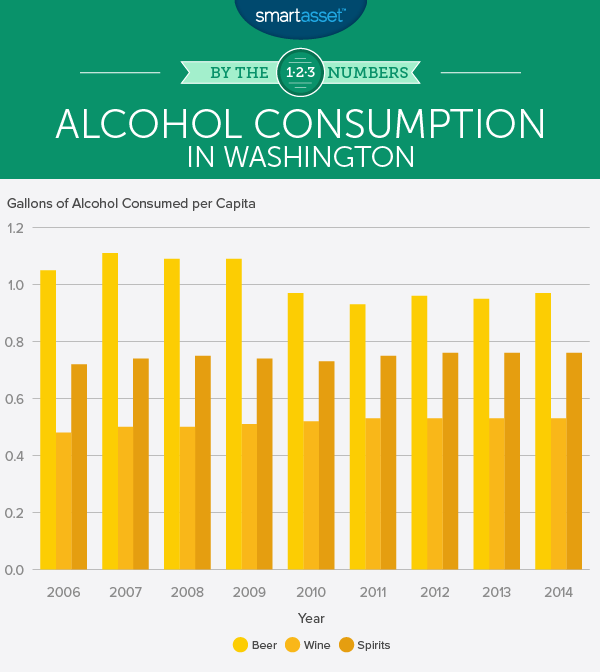 Washington falls in the middle of Tennessee and North Dakota – 16.6% of Washingtonians engage in binge drinking. Another way to examine if tax changes affect consumption is to look at individual states which have changed their sin tax rates over the years. According to the Tax Foundation, from 2007 to 2013, Washington’s excise tax on spirits went from $21.30 to $35.22 per gallon. The state excise tax on beer per gallon went from $0.26 to $0.76 from 2009 to 2013. And the state excise tax on wine per gallon remained unchanged at $0.87. One effect is that the increased tax on spirits seemed to slow consumption in Washington. From 2000 to 2007, spirit consumption increased by 10%. After the tax change, consumption of spirits remained relatively constant. The change on the tax on beer also appears to have had an effect, lowering consumption from 1.09 gallons per capita in 2009 when the tax on beer was $0.26 to 0.93 gallons of pure alcohol consumed per capita in 2011 when the tax rate was $0.76 per gallon. From 2007 to 2011, wine consumption in the Evergreen State rose 6%. Since 2011, it has remained steady. It’s a tough time to be a beer drinker in Tennessee. Compared to Washington, Tennessee has a relatively low tax on alcohol – only $6.90 per gallon combined for each of the three types of alcohol. However, the Volunteer State has the largest tax on beer. In fact, the tax on beer went from $0.14 per gallon in 2011 to $1.17 per gallon in 2013. An increase of 735%. From 2011 to 2013, beer consumption declined 7%, from 1.13 gallons of pure alcohol consumed from beer per capita to 1.05 gallons per capita, implying that the drastic tax jump may have an effect on consumers. Need more proof? Taxes on spirits and wine in Tennessee remained constant at $4.46 and $1.27, respectively, over the same time period, and consumption of both went up. 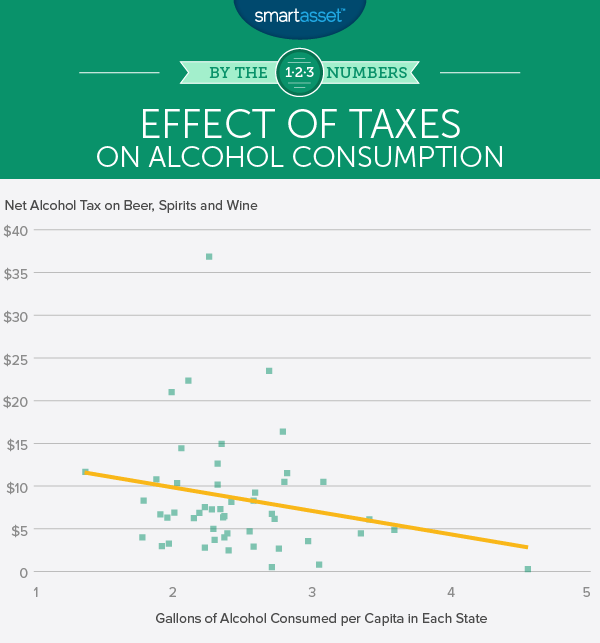 North Carolina is another interesting case when looking at the effect of taxes on alcohol consumption. According to data from the Tax Foundation, the tax on spirits in North Carolina went from $9 per gallon in 2007 to $13 in 2011. Meanwhile the tax on beer rose from $0.53 in 2009 to $0.99 per gallon in 2010 and then fell to $0.62 in 2011 where it has remained. Tax on wine saw a similar roller coaster ride from $0.79 per gallon in 2009 to $2.34 per gallon in 2010 and then back down to $0.79 in 2011. 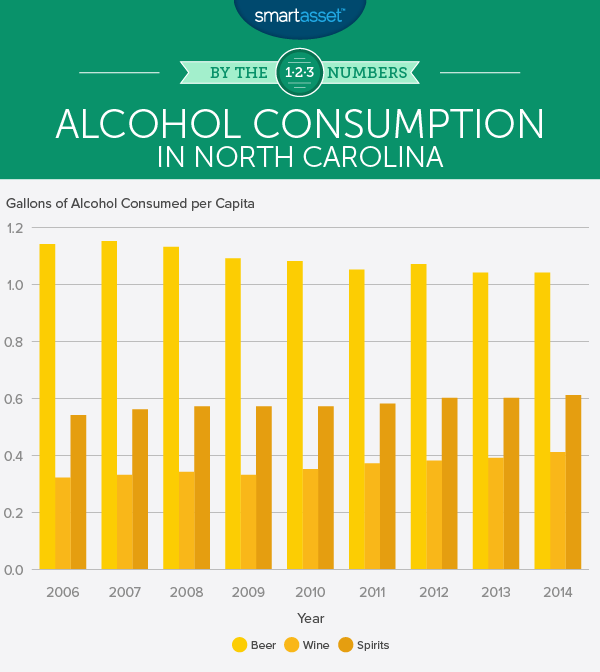 Unlike other states, raising taxes on spirits in the Tar Heel State did not deter drinkers. Spirit consumption increased from 2007 to 2011. Interestingly, the rises and dips in taxes on beer and wine had differing effects: beer consumption decreased while wine consumption increased. In most of the country, taxes on wine remain untouched. A few states like Maryland, Kentucky, Arkansas and Minnesota have increased taxes on wine in the recent past. In Kentucky specifically, the tax rate on wine rose from $0.50 per gallon in 2011 to $3.16 per gallon in 2013. Kentucky is a good state to investigate because the tax on beer and the tax on spirits did not change during that time, meaning we can see the isolated effects of an increase in the price of wine. As the graph below shows, wine consumption did not go down in The Bluegrass State despite the significant tax increase. It can be difficult to find causal relationships in this kind of time series data. For example, evidence from across the U.S. shows that over the past 50 years cigarette smoking in the country has been in the decline. Is this because of the increase in taxes, the fact that people are more aware of the health risks or the stigma that modern culture places on those who smoke? Or some combination of the three? One way we can try and track this is to compare across states. If we assume that each state’s attitude toward smoking is roughly the same and that on average people are uniformly aware of the health risks, then comparing cigarette tax rates across states should show us how effective they are. We used this method to estimate the effect of both cigarettes taxes and alcohol taxes. 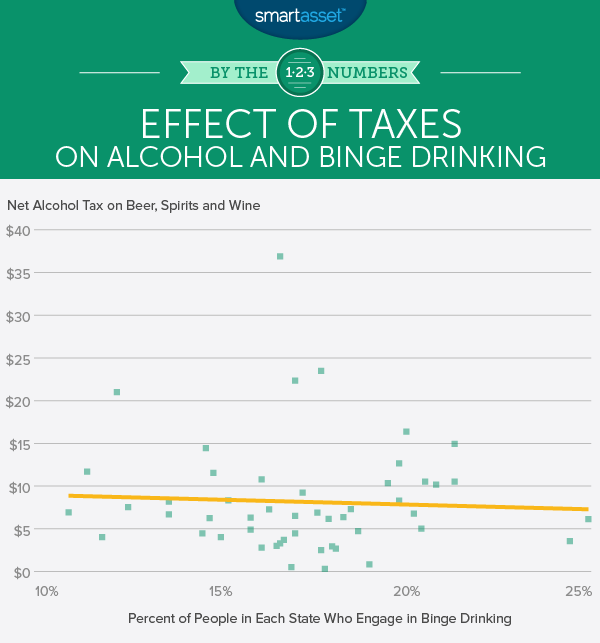 To do this we used the most up-to-date figures, which for taxes was 2013 and in cases like binge drinking was 2015. We also looked at individual states which had large tax increases over a short period of time to see how those affected consumption numbers. Another thing to keep in mind is that people do not change habits overnight even in the face of rising taxes, especially for substances like alcohol and cigarettes which can be addictive. So in cases where taxes were raised, it may take some time before people adapt to the price change and adjust their behavior. While it is clear that higher taxes have at least some negative effect on consumption, there are some methodological issues of which readers should be aware. One potential pitfall with our method is that whether or not a state decides to lower or raise taxes does not occur in a vacuum. A state can only raise or lower taxes if the population in general approves of the change. What this could mean is that consumption levels of alcohol and cigarettes may, in part, be responsible for the tax rates themselves. For example, if New York does not have a lot of smokers, it will be easier to raise taxes on those smokers. Data for alcohol tax rates from 2007 to 2013 is from the Tax Foundation. Readers should note that the state tax rates do not include additional local alcohol taxes. Data for cigarette tax rates in 2016 is from the Campaign for Tobacco-Free Kids. Binge drinking and smoking rates for 2015 came from the Centers for Disease Control and Prevention. Data on alcohol consumption per capita in Kentucky, North Carolina, Washington and Tennessee from 2006 to 2014 comes from the National Institute on Alcohol Abuse and Alcoholism and is estimated based on population aged 14 and older. It is measured in gallons of pure alcohol consumed from each drink type. So if a beer is 5% alcohol and a spirit is 40% alcohol, drinking eight units of beer would be equal to drinking one unit of spirit.